I fancy myself of fan of challenging things. I like 20 minute songs from bands like Marillion and Rush. I enjoy movies that hurt my brain and have to view multiple times to fully appreciate. Breaking Bad is my favorite TV show. And, as far as books go, give me one that forces me to think over one that espouses a simplistlic guide that will ostensibly solve all of my company's problems. Books with subtitles like "10 Ways to Do X" only serve to annoy me. 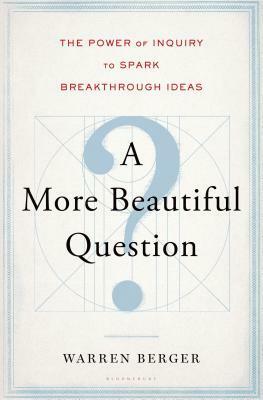 It should be no surprise, then, that I thoroughly enjoyed A More Beautiful Question: The Power of Inquiry to Spark Breakthrough Ideas by Warren Berger. His is no 10-step guide to business or self-improvement. On the contrary, AMBQ emphasizes the importance of not just mechanically taking the next step in business and in life. To this end, the book reminded me of Wait: The Art and Science of Delay by Frank Partnoy, another excellent text. Questions are more important than ever, a subject at the heart of my latest book. People like Steve Jobs asked big questions. While that alone won't guarantee success, plenty of innovation starts with questions, many of which are downright strange. Berger peppers his writing with a wide array of examples and a three-question framework of innovation: Why, What If, and How. For instance, how can you learn to love a broken foot? That question drove the development of better prosthetic feet. What if we could map the DNA of music? Enter Pandora. This is not to say that action isn't essential these days. Of course it is. But all too often we ignore fundamental questions: Are we on the right track? Are we climbing the right mountain? We had better be. Once we get there, we may be stuck for a while. Berger recommends occasionally unplugging from the Internet and embracing Lean Startup principles (re: experimentation). AMBQ made me think and wonder about not only what I'm doing, but why.